While this is a worthy subject for a page, a lot of the information on this subject is currently over at Coral reef. It would be good to transfer information that's primarily about ocean acidification over to Ocean acidification, leaving the effects on coral reefs at Coral reef. I'm too lazy to do this now. I also seem to recall that Staffan put some information about ocean acidification over on Greenhouse gas. I'll transfer that to Ocean acidification now. Once upon a time, Nullius in Verba raised some fascinating questions about ocean acidification on the Azimuth blog entry Dying coral reefs. We should also transfer the information obtained there to Ocean acidification. I'm too lazy to do that now. Yes I noted that when I wanted to create Ocean acidification as we agreed on the GHG thread. Thx ! Comment Source:Yes I noted that when I wanted to create Ocean acidification as we agreed on the GHG thread. Thx ! Purely by chance I've come across several pages that doubt pH change in the oceans (even before its effects). Added a section noting the questions, but I think someone who actually knows something about chemistry should answer them. Comment Source:Purely by chance I've come across several pages that doubt pH change in the oceans (even before its effects). Added a section noting the questions, but I think someone who actually knows something about chemistry should answer them. Added a section noting the questions, but I think someone who actually knows something about chemistry should answer them. Again, I think the easiest thing would be to start by describing the subtleties of what happens when you add CO2 to water, and why this is able to make the water more acidic. As Nullius in Verba pointed out here, it's actually quite subtle. It's very hard to get a straight answer from most people! But I think we did sort of straighten that out. So, anyone who knows chemistry, and can carefully read the blog discussion, can summarize what we discovered. Then there are harder questions, like some of the ones you raised. Comment Source:> Added a section noting the questions, but I think someone who actually knows something about chemistry should answer them. Again, I think the easiest thing would be to start by describing the subtleties of what happens when you add CO<sub>2</sub> to water, and why this is able to make the water more acidic. As Nullius in Verba pointed out [here](http://johncarlosbaez.wordpress.com/2010/08/18/dying-coral-reefs/), it's actually quite subtle. It's very hard to get a straight answer from most people! But I think we did sort of straighten that out. So, anyone who knows chemistry, and can carefully read the blog discussion, can summarize what we discovered. Then there are harder questions, like some of the ones you raised. The Wikipedia page on calcium carbonate is the best thing on this issue that I have found so far. See especially the section on solubility with varying CO2 pressure. Comment Source:I said this on the blog about the chemistry: The Wikipedia page on [calcium carbonate](http://en.wikipedia.org/wiki/Calcium_carbonate#With_varying_CO2_pressure) is the best thing on this issue that I have found so far. See especially the section on solubility with varying CO2 pressure. This in turn can hurt calcareous organisms such as shellfish and coral reefs. Comment Source:Btw, below "Idea" there is: > This in turn can hurt calcareous organisms such as shellfish and coral reefs. For more, see: > * [[Coral reef]], Azimuth Project. Wouldn't it be more fluent to write > This in turn can hurt calcareous organisms such as shellfish and [[coral reefs]]. There's so much about ocean acidification on Coral reef that I want a more obviously important link than the one you suggest, Frederik. Nonetheless my style of link could be improved, and now I've improved. You'll notice I took a while to reply to your comment! I'm replying now because I just added a bunch more information to Ocean acidification, in a section called Effects. This is mostly about coccolithophores. Comment Source:There's so much about ocean acidification on [[Coral reef]] that I want a more obviously important link than the one you suggest, Frederik. Nonetheless my style of link could be improved, and now I've improved. You'll notice I took a while to reply to your comment! I'm replying now because I just added a bunch more information to [[Ocean acidification]], in a section called [Effects](http://www.azimuthproject.org/azimuth/show/Ocean+acidification#Effects). This is mostly about coccolithophores. The first reaction is the formation of carbonic acid, namely H2CO3, from water and carbon dioxide. The next reaction is the splitting of carbonic acid into a hydrogen ion and a negatively charged bicarbonate ion, HCO3-. In the third reaction, the bicarbonate ion further ionizes into an H+ and a doubly negative carbonate ion CO32-. Stephen E. Bialkowski, Carbon dioxide and carbonic acid. 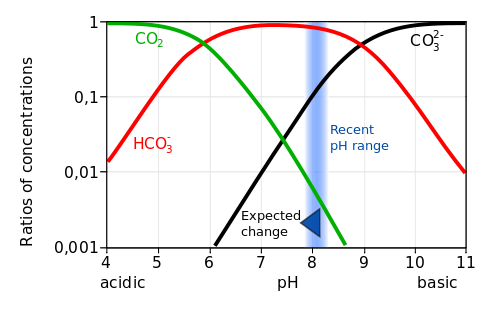 This is a big improvement over what we had, but we should also have a graph showing pH as a function of CO2 concentration, or something like that. In the process of doing this, I took the liberty of changing David Tanzer's post a bit, giving names to the relevant ions and adding Wikipedia links so people could look them up. I can undo this if David T. finds this distracting. This particular chemical reaction network, or stochastic Petri net, would make a good example for people wanting to demonstrate programs. It's important! Comment Source:I added more information about how increased CO<sub>2</sub> causes ocean acidification. Long-time readers of the Azimuth Blog will remember that the chemistry is a bit subtle. I got this new information from [David Tanzer's recent blog post](http://johncarlosbaez.wordpress.com/2012/12/20/petri-net-programming-part-2/). Here it is: <hr/> Here is a plot showing the concentration of various ions as a function of pH: <a href = "http://commons.wikimedia.org/wiki/File:Carbonate_system_of_seawater.svg"> <img src = "http://upload.wikimedia.org/wikipedia/commons/thumb/9/93/Carbonate_system_of_seawater.svg/500px-Carbonate_system_of_seawater.svg.png" alt = ""/></a> The key processes involved are these. Without carbon dioxide, these processes are continually occurring in water: H<sub>2</sub>O $\leftrightarrow$ OH<sup>-</sup> + H<sup>+</sup> H<sub>2</sub>O + H<sup>+</sup> $\leftrightarrow$ H<sub>3</sub>O<sup>+</sup> In the first process, a hydrogen nucleus H<sup>+</sup>, with one unit of positive charge, gets removed from one of the H<sub>2</sub>O molecules, leaving behind the <a href="http://en.wikipedia.org/wiki/Hydroxide"><b>hydroxide</b></a> ion OH<sup>-</sup> and a positively charge proton H<sup>+</sup>. In the second, this H<sup>+</sup> gets re-attached to the other H<sub>2</sub>O molecule, which thereby becomes a <a href="http://en.wikipedia.org/wiki/Hydronium"><b>hydronium</b></a> ion, H<sub>3</sub>O<sup>+</sup>. As the diagrams indicate, for each of these reactions, a reverse reaction is also present With carbon dioxide present, these reactions are also important: CO<sub>2</sub> + H<sub>2</sub>O $\leftrightarrow$ H<sub>2</sub>CO<sub>3</sub> $\leftrightarrow$ H<sup>+</sup> + HCO<sub>3</sub><sup>-</sup> HCO<sub>3</sub><sup>-</sup> $\leftrightarrow$ H<sup>+</sup> + CO<sub>3</sub><sup>2-</sup> The first reaction is the formation of <a href="http://en.wikipedia.org/wiki/Carbonic_acid"><b>carbonic acid</b></a>, namely H<sub>2</sub>CO<sub>3</sub>, from water and carbon dioxide. The next reaction is the splitting of carbonic acid into a hydrogen ion and a negatively charged <a href="http://en.wikipedia.org/wiki/Bicarbonate"><b>bicarbonate ion</b></a>, HCO<sub>3</sub><sup>-</sup>. In the third reaction, the bicarbonate ion further ionizes into an H<sup>+</sup> and a doubly negative <a href="http://en.wikipedia.org/wiki/Carbonate"><b>carbonate ion</b></a> CO<sub>3</sub><sup>2-</sup>. To see how these reactions lead to the graph above, see: * Stephen E. Bialkowski, <a href="http://ion.chem.usu.edu/~sbialkow/Classes/3650/Carbonate/Carbonic%20Acid.html">Carbon dioxide and carbonic acid</a>. <hr/> This is a big improvement over what we had, but we should also have a graph showing pH as a function of CO<sub>2</sub> concentration, or something like that. In the process of doing this, I took the liberty of changing David Tanzer's post a bit, giving names to the relevant ions and adding Wikipedia links so people could look them up. I can undo this if David T. finds this distracting. This particular chemical reaction network, or stochastic Petri net, would make a good example for people wanting to demonstrate programs. It's important! Not distracting at all, it's an enhancement, thanks. Comment Source:Not distracting at all, it's an enhancement, thanks. I took this new stuff from part 5 of Steve Easterbrook's summary of the 2014 IPCC physical science basis report. Comment Source:I added more to our page * [[Ocean acidification]]. I took this new stuff from part 5 of Steve Easterbrook's [summary of the 2014 IPCC physical science basis report](http://johncarlosbaez.wordpress.com/2014/04/14/what-does-the-new-ipcc-report-say-about-climate-change-part-5/).